Whether you love them or never tried them we are gonna try to make you fall for our fig creations this season. As a nutritious fruit that is mostly produced in California, we are going to share with you a few ways to spruce up your meals starting with figs on an all time favorite, pizza. Not only are they delicious and different, they add a little seasonal fun to your dishes and are great for parties. You will definitely be the one to make everyone fall for figs. Slice the onions to desired thickness and saute in a thick-bottomed pan with olive oil, salt and little butter until nice and brown. Roll pizza dough as thinly as possible on a cutting board or pizza pill (I like to use a rolling pin to do this.) Drizzle lightly with olive oil and sprinkle lightly with kosher salt and a pinch of pepper. 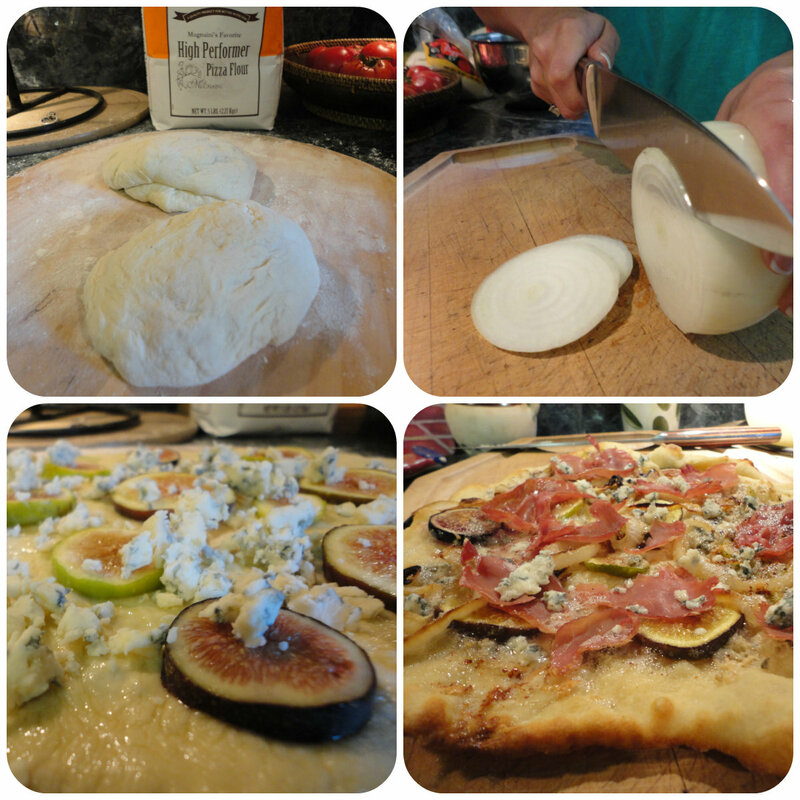 Cut the figs to desired thickness and arrange them on the pizza. Next, crumble the blue cheese and bake on a pizza stone for 10 minutes or when crust is golden brown. With 1 – 2 minutes left to bake, open the oven and add several slices of prosciutto to the pizza. Continue cooking until done. 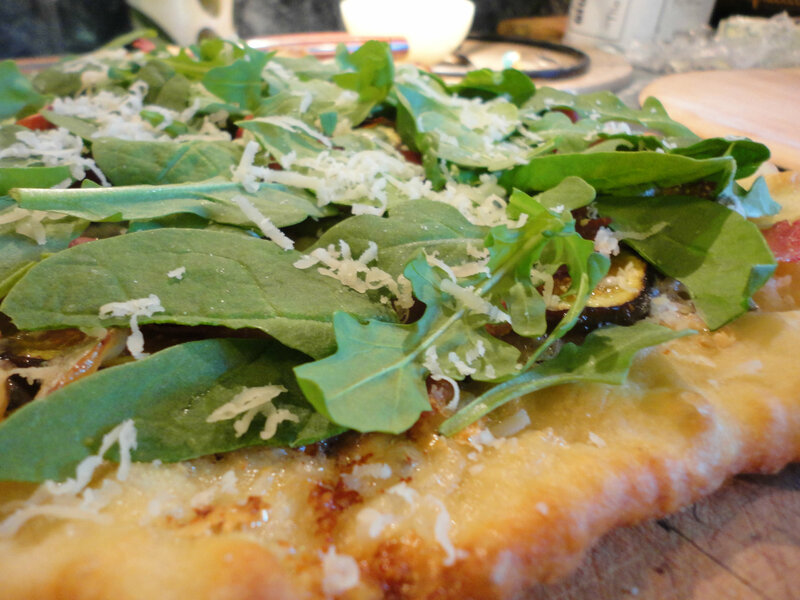 Top baked pizza with fresh arugula to add a bright peppery finish. For those of you who do not like onions or blue cheese, try sprinkling chopped rosemary on dough and substitute the blue cheese for goat cheese instead! Mix the yeast with 1/4 cup warm water in a small cup and set aside. Mix together in a separate bowl the flour and salt and slowly add the yeast mixture. Mix together with the additional 1 1/2 cups of warm water until dough forms a sticky ball. Cover the bowl with plastic wrap and let rise in a warm place until the dough doubles in size. Once the dough has risen, sprinkle the dough on a flour surface and cut into quarters. Knee the dough for about 10 minutes, adding more flour as needed. Set the dough aside and let rest for 15 minutes before preparing your pizza. Did you know? Fig trees have no blossoms on their branches. The blossom is inside of the fruit! Many tiny flowers produce the crunchy little edible seeds that give figs their unique texture.